Douglas Norman Wilson III, 75, our beloved husband, father, papa, and friend passed away April 9, 2019, from pulmonary fibrosis. A vigil service will be held on Friday, April 12, 2019, at 7:00 p.m. and the funeral liturgy on Saturday, April 13, 2019, at 11:00 a.m. both at Holy Spirit Catholic Church. Doug was born on January 29, 1944, to D. Norman Wilson and Stella Kenik Wilson. Doug’s greatest joy in life was his family. He and Shirley Nardinger met during their senior year of high school. They dated five years and married on June 18, 1966. They loved each other completely for 52 years of marriage, raised three daughters and took great joy in each of their eight grandchildren. Blessed in both good times and bad, their faith in God carried them through Doug’s diagnosis of pulmonary fibrosis during the last eight years. Never was his love of family and the outdoors more apparent than the time spent camping in Glacier Park and Swan Lake. In 1995, they built a cabin at Swan Lake, joining three other cabins to form what is affectionately referred to as the family compound. Campfires, jet skiing, scotch, kayaks, the family “floatilla,” cribbage, and themed reunions created smiles, laughter and countless family memories. Doug could often be found with his nephews and brothers-in-law building or fixing something, relaxing on a porch swing solving local and world problems and playing late night horseshoe tournaments. Shirley and Doug also had the opportunity to travel to the Caribbean, United Kingdom, France, Italy, Mexico, Hawaii, and take two very special trips to California with their children and grandchildren. 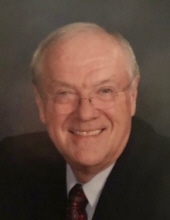 Doug enrolled in Army ROTC, graduated from the University of Montana in 1966 with a Bachelor’s Degree in Accounting and became a 3rd generation CPA. Commissioned as a 2nd Lieutenant he was assigned to the Army Finance Center in Indianapolis, IN. After two years of active duty, he served in the Army National Guard for seven years. The family moved back to Montana in 1969 where Doug joined Douglas Wilson and Company, Montana’s oldest CPA firm; established in 1913 by his grandfather. He followed in his father’s footsteps, becoming a partner in 1976 and President of Douglas Wilson and Company in 1988. He semi-retired in 2010, yet continued at the firm until this winter. For nearly 50 years, he thoroughly enjoyed working with clients, many of whom became friends. He felt truly blessed with great partners and staff throughout his professional career. Doug supported his community and church. He served on the boards of the Montana Society of CPA’s, Great Falls Camp Fire Girls Board of Directors, as President of the Ursuline Centre Historical Foundation Board of Directors, a Trustee of the Holy Spirit Catholic School Endowment and the Gladys Gerrity Scholarship Trust. He was an active member of St. Luke’s Catholic Church and later Holy Spirit Catholic Church. He and Shirley were part of the pre-marriage team for over twenty years, where they made life-long friends. Doug and Shirley found joy in helping others. Shirley coordinated a great group of people who donated food, clothing, furniture and supplies for anyone that she came to find in need. They most frequently served unwed mothers who held a special place in her heart. Shirley did the talking while Doug, organized, fixed and delivered the provisions. Doug is survived by his wife Shirley, daughters Paige (Doug) Nicholson of Great Falls, Barbara Jasper of St. Regis, and Holly (Wade) Bitz of Havre; grandchildren Spencer, Tyler, Julia and Stella Nicholson, Jacob and Carter Jasper, Emma and Ava Bitz; and sister Marilyn (Steve) Schmidt of Missoula. Doug’s extended family includes many aunts, uncles, cousins, brother and sisters in law; nieces and nephews for whom he had a great love and affection. His faith and the support of family and friends helped Doug live and love life to the fullest. He will be remembered for his grace, quick smile, honesty, integrity, work ethic, occasional irreverent sense of humor, kindness and compassion for all. Memorial contributions or donations may be made to Benefis Peace Hospice, 2600 15th Ave S, Great Falls, MT 59405, or the Pulmonary Fibrosis Foundation, 230 East Ohio Street, Suite 500 Chicago, IL 60611. To plant a tree in memory of Douglas Norman Wilson III, please visit our Tribute Store. "Email Address" would like to share the life celebration of Douglas Norman Wilson III. Click on the "link" to go to share a favorite memory or leave a condolence message for the family.